186 min. New Yorker Films. Director: Ermanno Olmi. Cast: Luigi Ornaghi, Francesca Moriggi, Omar Brignoli. There's nothing like a foreign film about the working class, and most especially a period one, to remind us 21st century Americans of how pampered we are. Consider if you will, by way of example, Ermanno Olmi's 1978 film L'albero deli zoccoli, a.k.a. The Tree of Wooden Clogs. The punchline that precedes the credits finds a family man muttering to his wife, "As if we needed something else to worry about." The something else to worry about, for these peasants, is the local priest's insistence that their little boy must start attending school. It's a four-mile walk for little Minek (Omar Brignoli) from what the opening titles tell us is "A typical tenant farm in Lombardy at the end of the 19th century, housing four or five peasant families." This micro-drama—which eventually lends the film its title after the boy's shoes begin to fail him—proves but one of several equally weighted subplots. One family's daughter of marriageable age, Maddalena (Lucia Pezzoli), gets courted by young Stefano (Franco Pilenga), a low-thrumming romance that develops with quiet inevitability toward the local Catholic altar, followed by a riverboat wedding trip to Milan and a honeymoon at a convent-orphanage. Another family would seem to be in the direst of straits: the widow Runk (Teresa Brescianini) oversees six children and their grandfather Anselmo (Giuseppi Brignoli), who delights the children of the tenant farm (and especially his grandchildren) with folksy wisdom and a musical sense of play. He has his own microdramatic subplot that emblematizes the film's slice-of-farm-life approach: he's at work on his batch of winter tomatoes, which he explains with pride will be the first in the region due to his secret technique to break through the cold earth with juicy new life. For all Anselmo's joy, the widow Runk frets away, contemplating giving up one or even two daughters to an orphanage in order to make ends meet. When their cow takes a turn for the worse, Runk prays desperately to God for salvation. Unsurprisingly, given the time and place and Olmi's own religiosity, faith plays a major role in the rural life the film depicts. The lives of the tenant farmers and their families are defined by this faith, honest toil, and the joys and pains of family growing up and old in close quarters. The last category includes churchgoing; public festivals of food, competition, and (itinerant) entertainment; private festivals of prayer, ghost stories and folk songs; and, when illness strikes, folk remedies. One might wish to read into a midesction run of scenes depicting, in turn, a merrily hustling traveling salesman, a priest delivering an energetic sermon, and a variety of vendors, political soapbox speakers, and other distractions at a local festival as a deliberate commentary on the church as one more voice making promises that might not necessarily pan out. But Olmi evinces the crystal-clear, though ever-tested, optimism of faith: even when the film ends on a sad and elliptical note, one can hear in the film's persistent use of J.S. Bach as score the promise that God stays with his people, perhaps especially the poor and struggling, wherever they may roam. Despite this Catholic sensibility, Olmi doesn't belabor it (so to speak). It's easy enough to appreciate The Tree of Wooden Clogs as a painterly near-documentary, shot and edited by a director who got his start in documentary films (it's no great stretch to see Brueghel the Elder in Olmi's natural-lit peasant scenes, and Olmi culled his nonprofessional cast from the locals of the province of Bergamo, where the director indeed grew up), or a spacious moral fable about humility and trust in following the righteous path. Brushes with larger social forces (soldiers and militant police suppressing rebellious youth) join the depiction of heartlessly greedy feudal landowners only put into greater relief the purity of the nesting communal bubbles of family and the tenant farm, guided as they are by traditional and moral and spiritual voices. At 186 minutes, this miniseries-turned-Palme d'Or winner at Cannes moves at a challengingly lifelike pace. But that is entirely by Olmi's design, as we see life through the eyes of peasants, plow fields with them, walk miles with them. That title, The Tree of Wooden Clogs, has a magical ring, which harmonizes with the film's flourishes of folksy culture, but in fact, the title describes an earthbound problem, and a solution that leads to an even bigger problem. Such is the life of these salt-of-the-earth peasants, whose lives of trying groundedness drive them ever to look to the heavens. 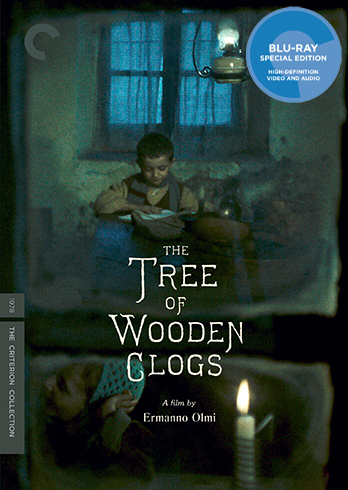 In its new Blu-ray special edition of The Tree of Wooden Clogs, Criterion presents new a 4K restoration, created in collaboration with The Film Foundation at L’Immagine Ritrovata and supervised by director Ermanno Olmi. Given those credentials, it appears this film has not only never looked better on home video, but never will look better in this format. Although a number of shots suffer from a blurred lack of focus, they are by far the exceptions to the rule and, most likely, endemic to the source material. As a rule, the picture yields excellent detail, fine contrast, and presumably true color (given Olmi's purported blessing of the transfer) amidst its natural film grain. Criterion presents the film's audio in an LPCM 1.0 track that preserves Olmi's preferred soundtrack, using the local Bergamasque dialect (needfully subtitled for Italian audiences as well as foreign ones), as well as an alternate Italian-language soundtrack. Both maximize the available elements for a definitively faithful rendering of the source. Bonus features include a new "Introduction" by filmmaker Mike Leigh (7:01, HD); "Ermanno Olmi: The Roots of the Tree" (52:31, HD), a 1981 episode of The South Bank Show featuring an interview with Olmi on the film and a visit to the farm where it was shot; a cast-and-crew discussion about the film at the 2016 "Cinema Ritrovato" (34:15, HD) film festival in Bologna, Italy; Interviews with Olmi from "1978" (7:08, HD) and "2008" (32:31, HD); and the film's "Trailer" (4:25, HD). As always, the disc comes packaged with liner notes: cast and crew credits, tech specs, and a critical essay, in this case "The Tree of Wooden Clogs: The Sacredness of Life as Understatement" by film critic Deborah Young. All site content © 2000-2019 Peter Canavese. Page generated at 04/25/2019 02:35:31PM.